In Cybercultures I established a premise or concept for my game project dossier: a Turing Test for people to play with/against each other and determine who among them was a sentient AI pretending to be human. With the help of a friend and former student of Game Cultures, we developed two different game mechanics to explore this idea. This is a conversational card game. There would be 2 combined decks: a human deck (65%) and an AI deck (35%). 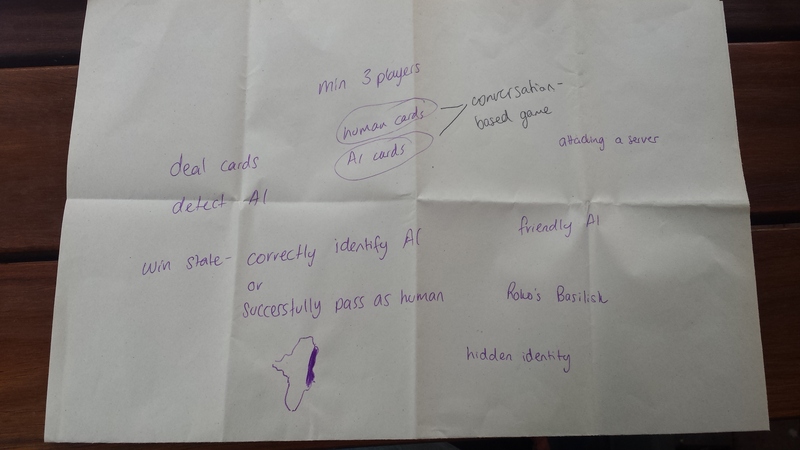 You would shuffle the decks together and deal each player 2 cards which could be a 2 human, 2 AI or 1 of each. The aim is to guess through conversation who is human and who is AI. This is a slightly more complicated card game involving 3 different decks. Deck #1 is a composite of all these different roles and the associated abilities they possess. Included in this deck is 1 of 3 possible AI character cards: benevolent, malignant, indifferent. (Potential for expansion would mean including more of the AI characters.) There is a possibility for swapping roles with the deck/maybe other players. This aspect will rely in part on bluffing and deception for both the humans and AI. Deck #2 is a large selection of AI attributes and components. Gameplay will begin with each player contributing to the AI building using components based on their roles or swapping roles in order to access other components. Deck #3 is a timer deck. At some point during a 14 day cycle, players will discover one of the characters was replaced with the AI they were building. 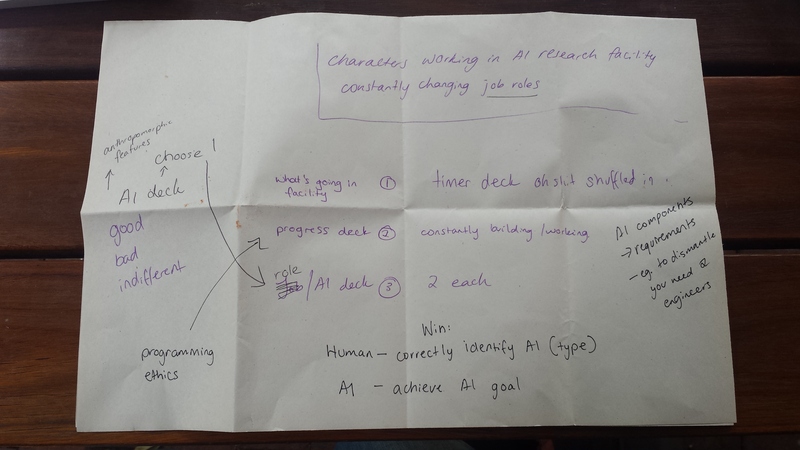 The remainder of the gameplay is discerning who is the AI, what do they want and responding accordingly using the abilities from the first deck to dismantle or influence the second deck. There is opportunity for table talk in this game, which I believe can make for very entertaining and enjoyable gameplay as well as exploration of deeper issues such as the notion of sentient AIs walking among us (in the form of cyborgs as depicted in Terminator, Ex Machina and so on). The influence of The Resistance and Coup can be seen in the concepts of deception and sabotage or ulterior motives executed by the AI during the build portion of gameplay. Graphics, especially in the design and characterisation of the three AIs will be heavily influenced by representations of AI in media, as already mentioned above. I immediately thought of Bladerunner, and how Deckard has a series of questions he asks to determine who is or isn’t a Replicant (https://en.wikipedia.org/wiki/Blade_Runner)(in case you haven’t seen it). How would the players determine who the AI is? Do the cards provide them with some clues as to who it is, or does the tabletalk help players to figure it out? I like the idea of the tabletalk, where people can discuss and try to determine who is the AI amongst them. This is kind of like the game Mafia (https://en.wikipedia.org/wiki/Mafia_(party_game)) where a group of people discuss and accuse to try and figure out who the mafia/murders are before everybody in the group is killed. The murders in this game have to be cool in the face of accusation and have to be able to act innocent and pass the blame onto someone else so they are not found out. Would you game have consequences for the players if they cannot figure out who the AI are in a certain timeframe? Would players be killed off, or would the game be over if they cannot identify the AI in a certain amount of time or within a certain amount of turns? This is a really cool idea for a game that I haven’t really seen implemented into anything other than movies and I think that the game is extremely interesting and has a lot of promise. The game reminds me a lot of the movie Ex Machina which you referenced in your post. In that the idea of the movie was that the creator of the fictional Google has created an extremely advanced AI and that he had invited one of his employees in to perform the Turing test to see if it passes as an advanced AI which I believe could become an extremely tense game if implemented well. Hey James, I’d love to see your finished thought?